The third segment of a romantic comedy series, It Takes a Man and a Woman raked gross earnings of 300-million pesos in just about two-week screenings across the country. The first two installments of the series that chronicled the love story of working girl Laida and media mogul Miggy have combined earnings of 400-million pesos. A Very Special Love was screened in 2008 with the second installment You Changed my Life shown the following year. Elsewhere, the romantic comedy has steadily lost its following, going on a downward spiral since 2012. Hollywood producers agree these are lean years for the genre. The top-100 films of 2008 included 11 rom-coms, all with an average gross earnings of 77 million US dollars. However by 2010 gross earnings have dropped to 53 million US dollars despite 14 rom-coms in the top-100 list. In these shores however, romantic comedies persist as top earners among mainstream productions. Directed by Cathy Garcia-Molina, It Takes a Man and a Woman predictably struggles through obstacles common to romantic comedies. It transports romantic love well beyond the cocoon and glow of newly discovered then threatened, and finally redeemed amour. Love is renewed as familial sacrifice with entire communities (the distraught lovers’ co-workers, immediate family, even airport ground crew!) helping to salvage its smoked-out embers. And while we know all will end well, that this recuperated love remains celibate up until the awaited wedding night, we laugh heartily anyway. In so many ways, Laida and Miggy’s love is panacea to the fraught romances whose looming shadows satiate hunger for real-time, real-life ruses. If indeed, we are to make sense of its success, we should earnestly consider the contexts in which the film was viewed and somehow unpack public fascination for the sometimes cumbersome romantic comedy, and why despite its humdrum turns, its predictable resolutions of well-worn conflicts; it ultimately seduces through its customary web of romantic throes and lovelorn fantasies. The weeks trailing the public screening of It Takes a Man and a Woman saw the public bombarded with intrigues, sumptuous fare concocted lockstep by show business and local politics rumor mills. Hugging the headlines were stories shoring media mileage for political parties and senatorial candidates, underlying the fact that politics and show business make for steamy, profitable company. Hovering above news of election campaigns were the reported abuse of the president’s sister by her ex-husband, the beleaguered May-December romance between a young actress and a politician whose countenance we see in endorsements for processed food (food and image equally processed for consumption). And last but not to be overlooked, the film’s lead actress’s purported severance of ties from an overly controlling mother who manages her career. Despite the film’s commonplace structure and narrative, laughter brims, the film audience heaving in unison alongside the quirky antics between reunited lovers turned rivals. Add to this the unfailing chorus of office workers, if there is any other comedic performance that rivals Geronimo’s it would be support cast Matet de Leon, Joross Gamboa and Gio Alvarez. For all appearances, Laida the self-made advertising executive seems empowered. Yet this is convenient illusion as she is not freed from the shackles of society’s expectations – proven loyal to family, nurturing, self-sacrificing, medievally chaste, amongst many. Frankly, I liked dragon Laida better than her ego-booster version. There is little to say about the film as the elements that guarantee its popularity are well too obvious. Foremost is the undeniable screen chemistry between singer-actress Sarah Geronimo and dramatic actor John Lloyd Cruz, her goofy, child-like persona a shining contrast to his worldly airs. Geronimo has comic timing, her little-girl appeal riveting as she easily transforms from on-stage performer to on-screen actress. Indeed, she is one of those celebrities who we dread to see all grown up. Her personal romantic woes feed rapacious hunger for the new, as they huddle talk-show feeds and entertainment magazine print space. Our imaginations stray to the coddled, golden-voiced Rapunzel. Geronimo is forever cast in the public imagination as the dutiful daughter capable of sacrificing personal happiness. Predictably we side with the wounded heroine whose only desire is to find true love. It is this seamless unity of Sarah as star-performer and dutiful rags-to-riches daughter that seals the deal. 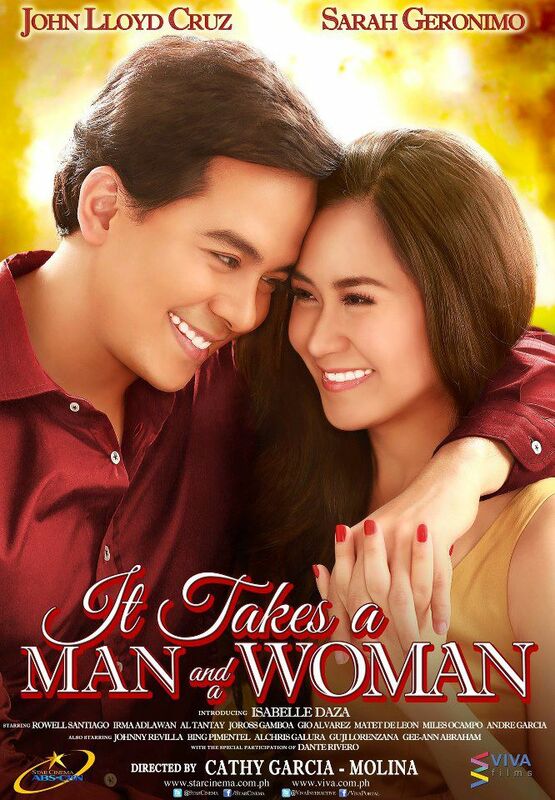 It Takes a Man and a Woman rehashed the romantic comedy with little or no challenge offered its viewers. Festooned with romantic froth, the film failed to challenge conventional ideas about romance. Nor did it offer a fresh way of conjuring obstacles to the fruition of romantic love. It is jarring to see Laida Magtalas’s character succumbing and in the end, dulling through her own volition her newly honed sense of self. It is only perhaps the acute timing of its public screening that endows this film uncertain redemption. Weighing its merits against the scandals stoking the last election campaigns, then a two-hour dose of romantic thrill becomes by all means, momentary salvation. A movie you don’t really Juana C.
The opening shot of Juana C. The Movie finds Juana (Mae Paner) falling down a very tall building, which is apropos for a movie that starts out with such great promise but gradually spirals down with a convoluted plot and a disturbing need to spell out – in bold, capital letters – its message to the audience that it eventually ends up with its face flat on the pavement. Screenwriter Rody Vera takes the popular social media character Juana Change, popularized by Paner, and gives her a background. We first see her as a simple-minded high school senior in a small village whose ecology is slowly being poisoned by a mining company operating in the area. The sight of a 40ish Paner as a teenager (and of the actors playing her parents who are clearly younger than her) is one of the film’s gags that signal to the audience that this is a movie that you can’t take that seriously. And it works for the first act of the film. We follow Juana as she enrols in Arneo University as a government scholar and befriends a young socialite (Annicka Dolonius) and her group of friends. She then meets Bayani (John James Uy), an attractive young man who takes a liking to her. We eventually witness Juana’s corruption as she becomes exposed to the lifestyle of the rich and famous, accruing huge debts and paying for them with sexual services, with Bayani acting as her pimp. It is around this point that the filmmakers get too enamored with their own self-aware conceit and lose the audience in the process. We are introduced to a whole array of kooky characters who are mostly caricatures of government and church officials. Juana meets Bayani’s mother, Peaches Tanquintera (Angelina Kanapi), the country’s top prostitute who makes her a protégé and teaches her the tricks of the trade. Peaches is privy to shady deals of the country’s elite (including a military general, a senator, a business tycoon, a bishop, etc. ), most of whom are bumbling idiots involved in the mining operations in Juana’s village. When Juana finds this out, she asks Hiro (Jelson Bay), a student activist who admires her, to help her come up with a solution. It all ends in a protracted screeching mayhem. Thanks to the film’s lecturing device that insults the audience’s capacity to think for themselves (many scenes have Juana break the fourth wall), the film’s message is made pretty clear: the Philippines is a fucked-up country whose elite are out to take advantage of the poor, and if we don’t get our act together, nothing will change. But by crafting a consciously slapdash movie, the filmmakers seem to be saying, “Don’t take the movie seriously; take the message seriously.” And that’s basically the movie’s downfall: it’s a message movie whose message is something everyone already knows in the first place. Go watch Juana Change videos on YouTube instead: they have none of the discombobulating shenanigans of the movie.